WHERE IS THE PORTOLA HOTEL & SPA LOCATED? The Portola Hotel & Spa is located in the heart of downtown Monterey, CA. Just steps away from historic Fisherman’s Wharf and the Monterey Bay, our hotel offers 379 well-appointed residential-style guest rooms and suites, 60,000 square feet of meeting space with the adjacent Monterey Conference Center, three on-site restaurants, a day spa and a variety of other amenities, perfect for both groups and leisure guests. HOW MANY GUEST ROOMS DOES THE PROPERTY FEATURE? The Portola Hotel & Spa features 379 guest rooms and suites. WHAT TYPES OF RESTAURANTS ARE LOCATED ON PROPERTY? The Club Room: Located inside the Portola Hotel & Spa, offers a daily European style breakfast buffet, featuring made-to-order omelets, house made pastries, bottomless mimosas and more. Dine on the pet friendly, heated patio boasting a fire pit and patio seating and enjoy the fresh coastal breeze from the Monterey Bay. Reservations call (831) 649-2698. Jacks Monterey: Located under the live trees in the hotel atrium, Jacks Monterey is Portola’s new restaurant offering California Cultural Cuisine. Chef Danny Abbruzzese’s inspiration and passion for creating signature dishes has brought him full circle to highlight different flavor profiles unique to cultures from around the world. Chef Danny uses traditional techniques from immigrants who call California home, while highlighting our locally sourced, sustainably conscious ingredients found throughout Monterey County. Open 7 days a week Jacks Monterey offers lighter fares at lunch and sharing plates at dinner. Reservations call (831) 649-7830. Peter B’s Brewpub: Located behind the Portola Hotel & Spa, Peter B’s Brewpub is Monterey’s original craft brewery that combines innovative pub food with award winning craft beer. Catch all your favorite sports on one of 18 High Definition televisions or relax on the pet friendly patio next to the fire pits. Reservations call (831) 649-2699. Happy Hour 4:00pm - 6:30pm daily. Late Night Happy Hour 9:30pm-10:30pm Sunday through Thursday. WHAT TYPE OF SPA & FITNESS FACILITIES DOES THE PROPERTY FEATURE? Overnight guests have access to the hotel’s spa and fitness facilities, complete with steam room, sauna, outdoor pool and Jacuzzi. In addition, the spa features separate men’s and ladies’ locker rooms and a relaxation lounge. The 6,000 square foot facility offers 10 treatment rooms and an extensive spa menu of more than 30 signature treatments. The fitness center offers the latest in Cybex cardiovascular and Nautilus resistance weight training equipment. The Spa on the Plaza is open daily from 9:00am to 7:00pm to both hotel guests and the public. The Fitness Center is open to hotel guests 24-hours a day. DOES THE PORTOLA HOTEL & SPA HAVE CONFERENCE AND MEETING FACILITIES? 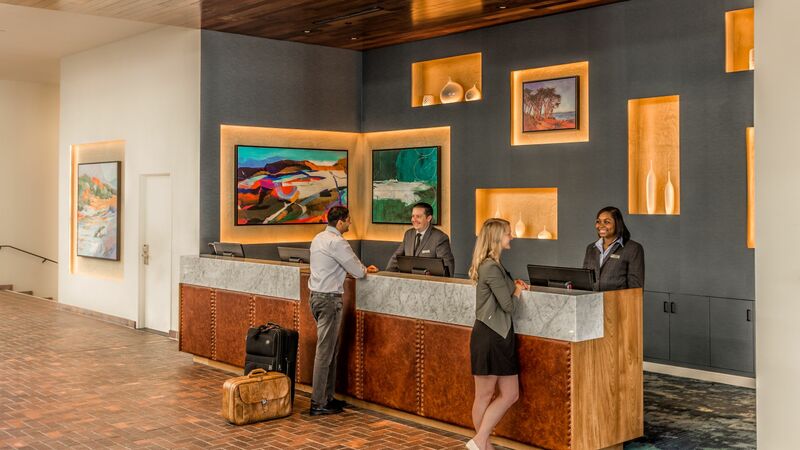 The Portola Hotel & Spa offers 60,000 square feet of meeting space with the adjacent Monterey Conference Center. Our experienced catering, convention services and on site event technology staff will professionally handle all the details of your meeting or special event. IS THE PORTOLA HOTEL & SPA PET FRIENDLY? The Portola Hotel & Spa is a pet-friendly property, including the patios at The Club Room and Peter B’s Brewpub. Outside our back door is a recreational trail and Del Monte Beach where you can walk endlessly with your pet. IS THE PORTOLA HOTEL & SPA ECO-FRIENDLY? WHAT IS THE COST OF PARKING DURING MY STAY? The Portola Hotel & Spa offers on-site parking with both in and out privileges. Daily self-parking is available for $20 per day and valet parking is available for $23 per day. During your arrival, check in is at 4:00pm. Check-out is at 12:00pm. Exit Airport on to Highway 68 West. Exit Highway 1 South. Stay in the right hand lane for next exit. Exit the Monterey/Fisherman's Wharf exit. At the first stoplight make a right hand turn onto Aguajito. Continue on Aguajito until it ends at Del Monte Avenue. Turn left on Del Monte Ave. and continue straight for three stoplights. Be in the left lane at the third stoplight (road will split - do not enter the tunnel). Once through stop light, hotel will be ahead, one block on right side. Take Highway 101 South to the city of Prunedale. Stay in right hand lane and look for the sign for Monterey Peninsula. Exit on Highway 156 to 'Monterey Peninsula'. Highway 156 will become Highway 1 South. Exit at Del Monte Ave. / Pacific Grove exit. Continue straight on Del Monte Avenue. Be in the left lane at the sixth stoplight (road will split - do not enter the tunnel). Once through stop light, hotel will be ahead, one block on right side. Take Highway 101 North. Take the 'Monterey Peninsula' exit which will bring you to Highway 68. Turn left on Highway 68 Exit on Highway 1 South. Stay in right hand and lane and take first Monterey exit. Turn right at the first stop light (Camino Aguajito Ave) and continue until road ends. Turn Left on Del Monte Avenue. Continue on Del Monte and continue straight for three stoplights. Be in the left lane at the third stoplight (road will split - do not enter the tunnel). Once through stop light, hotel will be ahead, one block on right side.